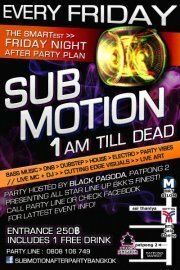 SUB: MOTION is Bangkok’s Weekly Friday after Party hosted by Black Pagoda, PatPong Soi 2. We bring you an all star line up of Bangkok’s finest DJ’s playing Bass Music, DnB, Dubstep, House, Electro & Pary Vibes, Cutting Edge Visuals & Live Art. Call our party line 0808 106 749 begin_of_the_skype_highlighting FREE 0808 106 749end_of_the_skype_highlighting for latest event info! Need Quick Help in Thailand?